Simplify and modernize digital infrastructure with software-defined data center solutions. Faster deployment, centralized management and easy scalability are the key takeaways SDDC can offer. GBM can help you transform your data center, with comprehensive SDDC solutions that are standardized, secured, scalable, automated, and highly resilient. The days of silo and costly infrastructure, which were individually managed, are over. How is SDDC transforming businesses? Infrastructure is virtualized and delivered as a service, making all kinds of equipment work together. Data center management is automated for greater efficiency. Virtualization is extended to every data center resource and service, simplifying management even further. SDDC can also drive dramatic savings in capital and operation expenditure. With GBM as your digital infrastructure partner, you can implement an SDDC solution that enhances performance and reliability, saves you time, and gets you ready for the future. Find the fastest and simplest route to digital transformation. 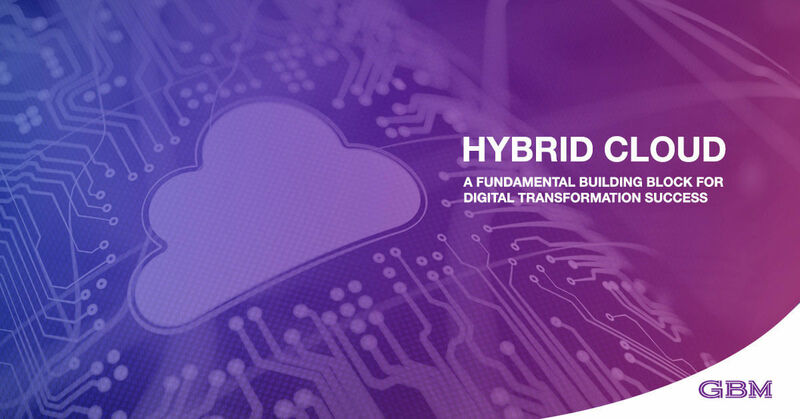 GBM offers the best-in-class hyperconverged infrastructure (HCI) solutions from leading vendors, engineered for mission-critical workloads and cloud capabilities. HCI combines storage, networking and compute in a single appliance. Deployment takes minutes, management is simple, and scaling your data center is as easy as connecting another node. Simplify everything by reducing dependence on scarce IT management skills, scaling out with a click, and having the ease of a public cloud experience in your private data center. The simple, “pay as you grow” scalability of hyperconverged solutions means you don’t have to replace existing infrastructure. As you add nodes and scale out, new storage and compute resources are automatically virtualized and pooled to handle bigger workloads. GBM can help you plan, deploy and manage your complete HCI solution, every step of the way. The ability to work on any devices gives your teams more flexibility – but it can also increase management burden and introduce new security risks. GBM can help you unify and simplify the digital workspace, with an integrated solution that lets you securely deliver any application, on any device. Employees benefit from a smoother workflow across devices. Productivity, management efficiencies and security are enhanced across the organization. Deliver the right experience to the employees, including applications, OSes, content and files. Simple, powerful access management policies keep apps and data highly secure. Enable employees to work on multiple devices anywhere anytime, including their own mobile device, Windows PC or Mac, from a single interface. with better security and management. GBM solutions also make updating devices and migrating software easier – one click can roll out updates and security fixes to thousands of employees at once. The digital workspace can make your software and device management simpler, more secure and more user-centric. Data is your organization’s most valuable asset, and making sure it is always available and protected against loss is exteremely crucial. GBM builds scalable and secure backup solutions, which protects all of your data across cloud, physical and virtual environments. With simple and centralized management ,should data loss occur, you can restore any snapshot or backup in moments. GBM can design, test and implement the right-fit data protection solutions, whether you want it on-premise or on cloud with the right scalability suitable for your organization. The journey to cloud is one of considerable organizational change. 80-90% of enterprises have multi-cloud strategy. Business outcomes improve significantly with each positive step, but it can be difficult to find the right path alone. Each organization has a unique starting point. The least digitally mature may still be running a traditional datacenter. Others have already adopted software-defined and private cloud approaches. Whether you need to conquer intense workloads such as AI, blockchain and IoT, or to deliver hundreds of services and applications, anywhere, GBM can help you implement the right cloud infrastructure services for your unique challenges. Respond quickly to changing business requirements, simplify network operations and dramatically reduce IT costs, with the industry’s most complete software-defined networking (SDN) solutions from GBM. GBM software-defined networking solutions are designed, implemented and supported to fulfill requirements in every industry. Governments, for instance, need to connect data centers in departments that span wide geographic areas. SDN automation can greatly improve cost-efficiency, as well as fueling innovation, in these use cases and many others. If your organization manages many apps, which need to be performant and ‘always-on’ to meet customer expectations, then you need an application delivery and traffic management approach that measures up. GBM can plan, implement and run your complete solution, with all of the load balancing, management and performance features you need. Whether your apps are used at a single location or globally, delivered by hybrid or private cloud, GBM can partner with you to meet the toughest security, availability and performance goals. For banks, that could mean protecting online services from fraud. For governments, it could be about faster performance at reduced cost. We’ll help you identify your own use cases and deliver the right-fit solution for your business. As data volumes at your organization grow, protecting against data loss becomes more challenging. Storage costs also rise. The answer is efficient, automatic and secure data backup and synchronization, so that everyone at your company – including in remote office locations – can access up-to-date files, and lost data can be restored in moments. Our experts can help you design, test and implement the right data protection strategy for your organization’s needs. Whether you require cloud integration, multi-site data replication, or better cost-efficiency, your solution starts here. Data centers are being transformed into cloud-integrated, software-defined, virtualized environments. This modern infrastructure also requires a modern approach to security, which is ready to protect data, applications and workloads wherever they go. GBM security experts understand today’s and future needs, and our comprehensive solutions integrate the industry’s best technologies to fit your business. Security is a top priority at every business, but your unique challenges depend on the nature of your organization and your data center. Securing public cloud workloads, preventing data breaches caused by human error, and reducing security management burden on IT departments are among the goals that GBM’s end-to-end solutions can help you address. Without full visibility into the data center environment, your organization may not be able to address operational problems and security challenges quickly enough to prevent downtime. With GBM, you can deploy a turnkey data center and networking analytics solution that provides multi-dimensional security across all kinds of workloads – including those running in multi-cloud environments. GBM solutions are ready to secure the most cutting-edge workloads, including AI-powered behavior analysis, unsupervised machine learning and others. All with a tailored, end-to-end solution that automates monitoring of every server process to quickly identify and respond to vulnerabilities and exposures. In today’s data-centric organizations, application workloads are growing fast. These increased demands often lead to costly infrastructure scaling – but before you spend more on hardware, why not discover if you can use your existing infrastructure more efficiently? GBM’s application monitoring and management solutions analyze your workloads, identify wasted resources, and ensure your hardware is utilized to the max. Whether you are considering a data center upgrade, working to reduce operational costs, or evaluating the best way to deal with growing workloads, you could achieve dramatic efficiency gains. GBM’s application monitoring and management solutions are for every business that wants to realize the full value of its infrastructure.